You’re fast asleep when the alarm goes off. Only seconds later, the Fire Chief comes bursting through the door, yelling. “We have a house fire out in the suburbs.” You’re a heavy sleeper, you grunt and turn around. Not a good character trait in a fireman, you know. “The 911 caller said there’s a guy in a business suit trapped inside,” the Fire Chief goes on. You put the pillow over your ears. “There is also a kitten!”. Less than a minute later you have your protective clothing on and sit on the firetruck, sirens blaring, going towards the suburbs. Fireman was one the jobs we all wanted to have when we were kids. You’d get to ride the fire truck, rescue kittens and be a hero, generally. And you’d get to slide down the firepole! For most of us, the prospect of being a fireman became much less attractive later in life, when we realized it’s a hard job that doesn’t pay as well as it should and may actually get you killed. We still want the firepole, though. I dare you to ask your friends if they wouldn’t want an apartment with a firepole. They’ll all say yes. Actually, I dare you to comment here whether you want a firepole in your apartment. Anyway, with Flash Point: Fire Rescue you can daringly rescue whole families – including their kittens and puppies – from raging infernos without any risk for your own health. Also without a firepole, that’s five points taken from the final score. When your team of up to six firefighters arrives at the scene, the house is already pretty much lost – there is no way to save the building in Flash Point, your job is to get the people out. 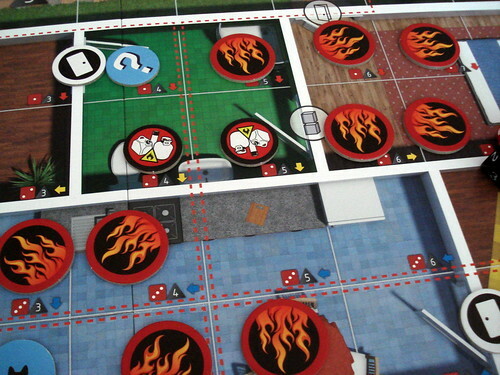 The game board is printed on both sides with different floor plans and the fire is distributed around the house semi-randomly, making sure there is some fire everyhwere. Three “Points of Interest” are also distributed around the house – these may turn out to be victims waiting to be rescued, but there is the occasional false alarm as well. If you’re playing the advanced game – I’d recommend you do unless you’re playing with children – you also place some hazardous materials that will explode when they catch fire and some Hot Spots that cause fires to flare up again. It is now time for your team to pick their roles and move in. Unlike other cooperative games with different player roles – like Pandemic or Forbidden Island – you are not tied to one role for the whole game. When stating your turn at the fire truck, you can switch to a different role. Sometimes that’s very convenient, but we didn’t make too much use of this option because the usefulness of the roles varies wildly. The Driver/Operator, for example, is essential for a successful operation. The Imaging Technician, on the other hand, may have his moments sometimes but is generally not worth picking. If you have played any other recent cooperative game, the structure of a turn will sound familiar: first you have a limited number of action points to do things, then you advance the fire. Your actions include the obvious things like moving (one action point per square, unless it’s on fire), opening or closing doors and extinguishing fires. Less obvious but very useful is the option to chop down walls with your fire axe. Each wall takes two points of damage, either from your or from the fire, then it’s damaged enough to walk through, easily creating shortcuts or bypasses for areas on fire. However, you shouldn’t overdo it with the chopping, the house as a whole can only take a limited amount of damage before it collapses, killing everyone inside. But your primary goal is not to destroy the house. (And they both only have a single floor, so no amount of chopping will let you place a fire pole.) Your real goal is to rescue the victims: when you reach a Point of Interest marker you turn it over and discover if it’s a victim. If it is, you can carry it with you and take it to the ambulance outside, but carrying a victim doubles your movement cost. Playing the advanced game you get some more options that, at first glance, make the game slightly easier, but with the Hazmat and Hot Spots added, the whole game still becomes more difficult. These new options include using the most powerful weapon you have in fighting a fire: the fire truck. You can drive the truck around the house and fire the powerful deck gun at the quadrant of the house you’re currently parked next to. The deck gun puts out the fire in a randomly determined square of the house and the four adjacent squares. For a mere mortal fireman, shooting the deck gun costs four action points: a full turn. The Driver/Operator, however, fires it for only two points and may reroll the targeting dice – that’s why we never leave home without one. And if you really don’t know what to do with your actions, Flash Point lets you save up to four action points for your next turn. Actually, that’s not only when you don’t know what to do, there is a big strategic potential attached to it: if you don’t want to end your turn next to a roaring blaze of fire, you can save your actions and sprint past it next turn. While you’re trying to take people out of the house, the fire does what fire does: burning down the house (cue music, we were singing that one line frequently). 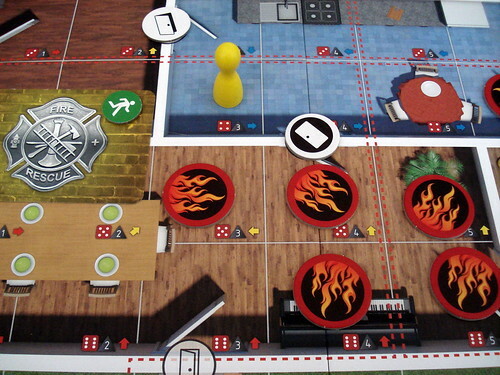 The fire spreads by rolling two dice and placing a new token in that place on the grid. If that spot is so far undamaged, you put a cloud of smoke there. Spaces that have smoke already burst into open flame and squares already on fire explode. Explosions, if you hadn’t guessed, are bad for you. They put a fire token on every adjacent square and do a point of damage to every wall. If the surrounding squares are on fire already, then the explosion spreads through them and has its devastating effect on the first free square. Hazardous materials have the same effect. And if there is a Hot Spot in the target square, your troubles just multiplied: you roll again. And if you hit a Hot Spot again, just keep doing it. My record, as the brilliant die roller that I am, is six Hot Spots in a row, causing four explosions in the process. We lost that game. As usual in cooperative games, there are fewer winning conditions than there are losing ones: you win by rescuing 7 victims, you lose by letting four of them get killed – standing in fire or next to an explosion obviously isn’t good for them – or when the house collapses from taking too much damage. If you don’t take care, that happens much, much faster than expected. There is obviously a huge amount of luck involved, but fire usually spreads quickly, and once you have a big area in flames, you keep getting explosions that spread it. What are you storing in your bathroom? That’s why our standard team in more than two players always includes the Driver/Operator and the CAFS Firefighter. CAFS is a system to spread fire-retardant foam, so this guy is another specialist in putting out fires. This setup lets us control the fire almost indefinitely while slowly getting the victims out. With more players, the next pick is usually the Paramedic who can put the victims upright just long enough to get them out of the house. They still need to be accompanied, but without the double movement cost. The other roles only see the game with more players or in very special circumstances: taking the Hazmat Technician when three suspicious looking canisters are lined up next to the fire is a good pick. Some roles – the Paramedic and the Rescue Specialist – pay double to put out fires, so you’re generally better off playing to your strengths. That’s fine and well for almost everyone, you can still do what’s necessary, at a higher price. Only the Operator/Driver may be somewhat unhappy about it: he goes around the house like in the fire truck on a merry-go-round and keeps shooting the deck cannon. 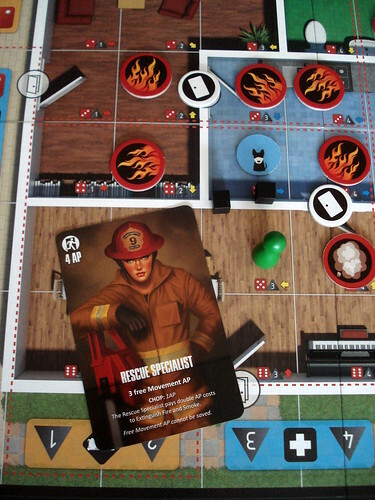 Apart from the plight of the Driver and the not quite balanced roles, I have little to complain in Flash Point: Fire Rescue. The illustrations vary a bit in quality, with the role cards being at the top end and looking great. The games tend to be tense at the Veteran and Hero levels of difficulty, you need to coordinate well to rescue the victims trapped in the fire. Luck does play a big role in how the fire spreads, but rarely so big that you feel you couldn’t have won, in hindsight. I still need to take the points of for not including a firepole – and also need to keep looking for an apartment that has one . Apart from that big disappointment, Flash Point is a thoroughly enjoyable game, even if you’re not as crazy about cooperative games as we are. One question, however, for the end of the text: in the German translation the Imaging Technician is translated as using an infrared camera. If there are any real firemen reading this, can you tell me if that is really a tool you use? Infrared to find people sounds a bit pointless when there is a fire in the background. Editor’s note: there is not a single mention of firemeeple in this review. You’re losing your touch. Try harder next time!